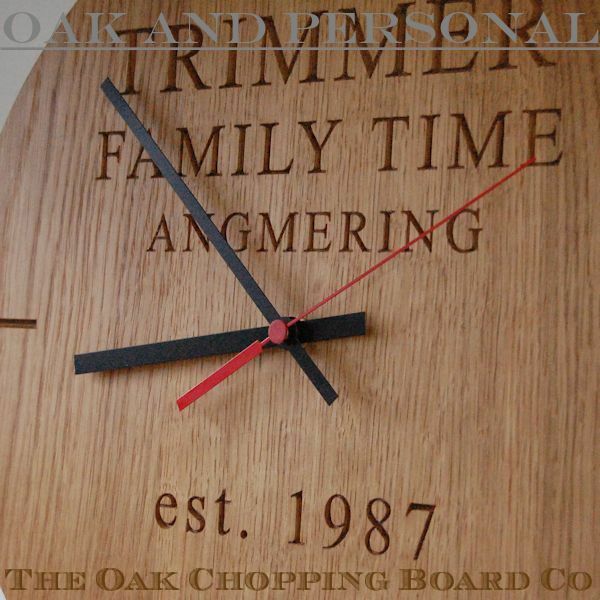 The perfect gift for any occasion (ideal for wedding, anniversary or house warming), these wooden wall clocks, designed by us, are as individual as their owners. 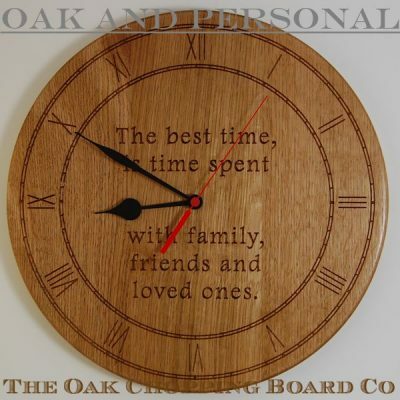 Our wooden wall clocks are hand crafted from full-length stave English or European oak and are available in two sizes (30cm diameter and 38cm diameter) and are 2.7cm thick. The traditional clock has the face engraved with two chapter rings and roman numerals and the hands are of a black metal “spade” design. The modern clock, which we have just introduced, has just 4 hour markers engraved at the 3, 6, 9 and 12 o’clock positions, and is fitted with straight black “baton” hands. 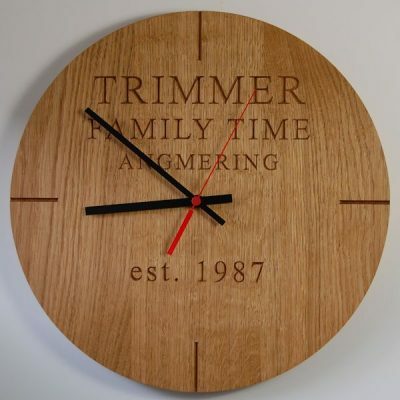 This provides for a minimalist look as well as allowing for larger engraving of any personalised message. All wooden wall clocks now come with a red second hand, and are fitted with a German quartz clock movement, which is RoHs approved and manufactured to ISO9001 standards. The movement requires 1 x AA battery which we supply with the clock. 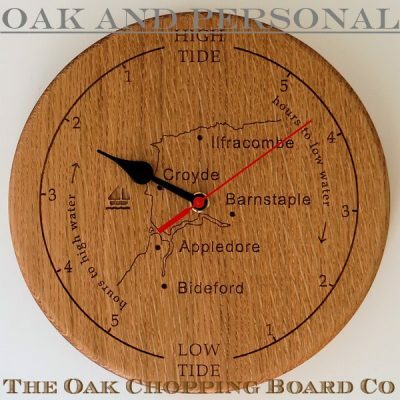 Our wooden tide clocks are now available, and make a great gift for someone living by the coast or anyone interested in coastal conditions. Synchronised to the moon’s cycle, this tide clock gives you an innovative and convenient guide to tides at your chosen location, indicating the number of hours remaining until high and low water.